Tag Archive | "steam technology"
Many recent messages have looked at living, business and investing in chaos during times of turmoil and change. Ecuador at times may seem chaotic. Chaos is caused by transition from one wave of productive technology to another. Investors and businesses who understand this have an enormous advantage because they know to look for the next wave. In a moment, we’ll look at the potential for chaos in Ecuador. First, let’s look at some positive chaos that could ruin some basic utilities but also create millions (maybe billions) for some businesses and investors. The industrial revolution has been a time of continual chaos. There was a time of turmoil when mankind shifted from steam technology to the internal combustion engine. Investors who had been big in railroads (but were smart) shifted to investing in automobiles and trucking and bus lines. Then chaos came again when the jet engine made the airplane a more effective form of transportation than long distance. Bus travel and smart investors shifted from Greyhound into airline shares. In the information era; the PC, Internet (and Microsoft) became the major carrier of mankind and investors who saw this potential once again jumped ahead of the pack. One new wave of technology may come in a product we all take for granted…. creating what I would call the independence era. Let’s just look at the break through. A forward looking reader sent me the Utah Daily Herald article “New battery could change world, one house at a time” by Randy Wright. Here is an excerpt: On a modest building on the west side of Salt Lake City, a team of specialists in advanced materials and electrochemistry has produced what could be the single most important breakthrough for clean, alternative energy since Socrates first noted solar heating 2,400 years ago. — a new generation of deep-storage battery that’s small enough, and safe enough, to sit in your basement and power your home. It promises to nudge the world to a paradigm shift as big as the switch from centralized mainframe computers in the 1980s to personal laptops. But this time the mainframe is America’s antiquated electrical grid; and the switch is to personal power stations in millions of individual homes. The battery breakthrough comes from a Salt Lake company called Ceramatec, the R&D arm of CoorsTek, a world leader in advanced materials and electrochemical devices. The convergence of these two key technologies — solar power and deep-storage batteries — has profound implications for oil-strapped America. With small-scale electrical generation taking place at millions of individual homes — as opposed to today’s large-scale power generation from a handful of giant power plants — there would be less worry about what’s called “point failure” on the grid. That’s when a single component gets knocked out and shuts off power to a whole region. California-style rolling blackouts would be history. The threat of terrorism has heightened the worry. But wide distribution of batteries in homes would virtually eliminate it. Inside Ceramatec’s wonder battery is a chunk of solid sodium metal mated to a sulphur compound by an extraordinary, paper-thin ceramic membrane. The membrane conducts ions — electrically charged particles — back and forth to generate a current. The company calculates that the battery will cram 20 to 40 kilowatt hours of energy into a package about the size of a refrigerator, and operate below 90 degrees C.
This may not startle you, but it should. It’s amazing. The most energy-dense batteries available today are huge bottles of super-hot molten sodium, swirling around at 600 degrees or so. At that temperature the material is highly conductive of electricity but it’s both toxic and corrosive. You wouldn’t want your kids around one of these. The essence of Ceramatec’s breakthrough is that high energy density (a lot of juice) can be achieved safely at normal temperatures and with solid components, not hot liquid. Ceramatec says its new generation of battery would deliver a continuous flow of 5 kilowatts of electricity over four hours, with 3,650 daily discharge/recharge cycles over 10 years. With the batteries expected to sell in the neighborhood of $2,000, that translates to less than 3 cents per kilowatt hour over the battery’s life. Conventional power from the grid typically costs in the neighborhood of 8 cents per kilowatt hour. Re-read that last paragraph and let the information really sink in. Five kilowatts over four hours — how much is that? Imagine your trash compactor, food processor, vacuum cleaner, stereo, sewing machine, one surface unit of an electric range and thirty-three 60-watt light bulbs all running nonstop for four hours each day before the house battery runs out. That’s a pretty exciting place to live. And then you recharge. With a projected 3,650 discharge/recharge cycles — one per day for a decade — you leave the next-best battery in the dust. Deep-cycling lead/acid batteries like the ones used in RVs are only good for a few hundred cycles, so they’re kaput in a year or so. How do you recharge? By tapping your solar panels or windmills. It’s just like plugging in your cell phone or iPod, only you plug in your house. A small three-bedroom home in Provo might average, say, 18 kWh of electric consumption per day in the summer — that’s 1,000 watts for 18 hours. A much larger home, say five bedrooms in the Grandview area, might average 80 kWh, according to Provo Power. Either way, a supplement of 20 to 40 kWh per day is substantial. If you could produce that much power in a day — for example through solar cells on the roof — your power bills would plummet. The long-term impact of home electric generation for a power company’s business model could be huge. After all, you can’t stay in business if nobody’s paying for power. Exactly how that will play out remains to be seen. This technology is new to me… but seems breathtaking and loaded with opportunity. Please send any thoughts, ideas, information or opinions you have. Before you invest though, remember the golden rules of investing. The people of Ecuador are friendly and happy. There is some potential for change in Ecuador that could benefit those moving and investing there. First, let’s look at the cause of the turmoil. A recent message entitled Investing Internationally shared news about the Ecuadorian government’s plan to take back a number of radio and TV frequencies stations. We promised to stay tuned to what happens and share observations and opinions from trusted sources in Ecuador about this. Since that time, the Western press has published even more bad sounding news. A recent AP article entitled “Ecuador Wants Citizen Committees To Defend Gov’t” said: QUITO, Ecuador — Ecuador wants to create local citizen committees that would defend the government and its “revolution” — sparking criticism that the president aims to control opponents in a system reminiscent of Cuba or Venezuela. Citizen Participation Minister Doris Soliz told Ecuador TV on Thursday that local citizen groups are needed to defend against coups like the one that recently deposed Honduran President Manuel Zelaya, or against outside agitators, noting U.S. military plans to use Colombian bases. Other articles covered lots of rhetoric from Venezuela’s President about winds of war in the area (Chavez’s commenting on the announcement that the US would place military in Colombia). Since the daily press distort, dramatize and magnify the negative; here are more comments from Ecuadorian business people with this comments. Dear Gary: Sorry for the delay in my reply. Correa is an unpredictable president. On one hand he tries to emulate everything Chavez has done in Venezuela. It is clear that Chavez gave him millions to finance his political campaigns and now he is obligated to do whatever Chavez wants. On the other hand, he knows how far he can push the people of Ecuador. If he is not careful, he can end up like Zelaya in Honduras. I see strong confrontations coming if he tries to close radio and TV stations like Chavez did. As you say in your reports. We all need to be diversified in order to avoid problems in one place and not have anywhere to go in thing go bad. I do believe the Ecuadorians are not as passive as the Venezuelans, and if Correa pushes too far he will find out. Let’s wait and see. I agree with this reader. Ecuadorians are an independent people, and I have watched them (peacefully) oust a number of Presidents who abused their power. Here is another opinion from one of my many sources. Gary, My comments are just some personal opinions and for that reason I prefer that I not receive any credit. There is some noise going around that Correa wants to have “block leaders” who will report back to the government of any dissent. You can imagine what this means. Stifling dissent. It is a time to be careful and hope the Ecuadorian military remains faithful to the people of Ecuador. While there are so many needs and opportunities in Ecuador to be attended to, one could ask why does the president feel it is necessary to be out speaking of “winds of war blowing” against Colombia? Anyway, it all comes with the territory of being in the Latin governmental world I suspect. If the leaders were just humble people looking to improve the lot of their people instead of being megalomaniacs hell bent on being Castro or Hitler, life would be easier for all. 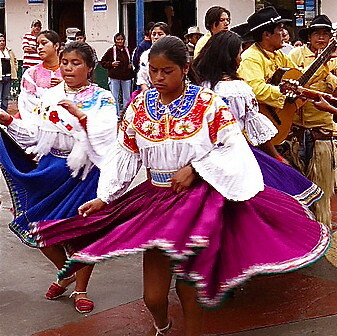 Here are children in a parade in Cotacachi. Readers should note that it was not Correa, Ecuador’s president who made the comment about Winds of War but Chavez of Venezuela. A lot of press makes it sound like Correa is much more closely aligned with Chavez than I believe he is. Good or bad, I do believe that Correa is his own man and is pretty independent. Here is another comment by an Ecuadorian with a great political and historical background. a proverb in Spanish “mas sabe el diablo por viejo que por diablo”. (The devil knows more because he’s old than because he’s the devil). That is Correa’s problem. He is not old enough. Velasco Ibarra who was president five times, was very much like Correa, when he was young. When he grew older he became much more sedated. Again I agree with this. Everything I have seen has led me to feel that Correa has many good intentions and is trying to correct many wrongs and has a big job. In his youth he may be too ambitious and impatient. Time, inertia and politics should correct a lot of that! He usually talks too much. He talks every Saturday for 3 or 4 hours continuously. It is not highly recommendable to quote him or mention his speech. Sometimes he just changes his mind. Or does not follow what he mentioned in the previous weekend. That could describe more than one politician! I have met the President a couple of times. He actually stopped next to us on the street at 9pm at night and met our son and was very sincere and asked what we thought about how things were here in Ecuador. He is very headstrong, but I think that he is a very intelligent guy and he knows how to negociate and what it is going to take for Ecuador to become a stable economy and that is with foreign investment and tourism. Again this is the way I see it as well. Dear Gary: Many thanks for sharing the concerns some of your readers have about President Correa. I get some emails on the subject too. I should start by saying that I am no fan of President Correa, far from it. I don’t particularly like his discourse as if from the union trenches of the 60s and 70s. Some of his economic policies seem to go counter current and his relative closeness with Chavez is a blemish. Nonetheless, there are merits too, amongst which is great effort in improving education and health care. Also, in attempting to fix some wrongs and distortions we’ve had on several fronts. In spite of Correa’s antics, Ecuador continues to offer, and perhaps more so than ever, rather remarkable opportunities for real estate investors, visitors and expats. The new, fresh-out-of-the-oven, Ecuadorian Constitution states, following with the tradition of the previous one, that foreigners have exactly the same rights as Ecuadorians under the law. Furthermore, private property is protected under the law as one of the main pillars of our economy. Confiscation is prohibited and eminent domain (expropriation) situations are extremely rare, much less so than what they would be in Miami, London or Toronto for that matter. While some people may believe that Correa is not particularly pro foreign investment, the reality is that Ecuador, just as the next country, needs investment to prosper and, hence, the President is very welcoming of it, he just demands responsible practices. While the pitfalls of politics-as-usual and nationalistic grandstanding in Ecuador, can and does preclude some major investments from coming in (picture hydroelectric, oil exploration, etc), for most of us, of your readers Gary, this should not be a problem. Regarding the Government’s stance towards foreigners coming to Ecuador and investing here, something quite nice and reassuring happened to me recently, which is telling about how reality differs from perception. While working in the concept for a coastal development with international capitals and geared mostly towards foreigners, we realized that better government planning and zoning was needed in the area if we were to spread our wings the fullest. I decided to call the Production Ministry, which is a high level coordination entity on top of many other ministries in Ecuador to see if they could perhaps give us some light as to getting some better zoning for the area. I was immediately transferred to the head authority in charge of foreign investments in Ecuador and in a few hours was meeting with him along with other officers from the ministry he had called in. They were not only incredibly welcoming of our ideas and concepts but asked us to create with them a road map not only for planning and zoning, but for infrastructure, education of the local community, and much more. They have let me know that they are ready to lend a hand as needed and that when the time comes, once we have things down on a plan we can meet with the secretary of the ministry and even President Correa for further vision. What is the reason for this incredible support? Well, that they are really pro investments and that when you want to do the right thing, doors become open. On the subject of visas, something that concerns many foreigners, I can say that the President has prompted a very open regime for foreigners to come to Ecuador. However, some changes in the procedures are driving some of us nuts. We just have to adapt. In any case, you can expect to get a resident visa in Ecuador in 3 to 6 weeks in most cases. The new director of Migration is quite a gentleman and very open and understanding. It’s a pleasure to work with him. With regards to some radios being closed, this is something the President declared as a possibility on grounds that some radio frequencies had been granted with irregularities according to an audit. While the audit may be correct, President Correa does have a bitter quarrel with the press and his fixation with it is over the top now. Getting back to real estate; I’d like to add that foreigners have been investing and buying real estate in Ecuador for some time, and that this is a trend that is seemingly quite on the rise. I am seeing the start of a major wave here. Ecuador has excellent real estate opportunities and values and the current international crisis where former “safe havens” have been shattered is making this truth about Ecuadorian real estate all the more compelling. Investors into Ecuadorian real estate ought to buy soundly into capital preservation and important appreciation potential. As final thoughts, given the current financial problems the world is seeing, the violence in Mexico fending off tourists and investors… the bursting of the real estate bubbles throughout, the baby-boomers coming of age with individuals lusting for active living with quality of life to boot, Ecuador is starting to make some tremendous sense to many. Our President may be a bit of a showman (to put it somehow), granted; and we as a nation have a ways to go into maturity; we are rough around the edges, but we may have among the warmest, most welcoming people on earth, and no development can buy that. We have good infrastructure and low cost of living. Those who see beyond the perception should be able to get in early on the trend, ride this major wave and make the best out of it. These are good points… especially this one… the government may be talking one way or the other… but look at how it is acting. In this case it appears that the government is pro tourism… pro investment and is welcoming residents from abroad. Here is one final comment. Gary, I don’t get involved in my host country’s internal politics. I am however a strong believer in the Open Society and the value of ideas meeting arguments, so I guess I would prefer more media outlets to fewer. By the by, Ecuadorians I know say this is the first time they feel they cannot express freely what they feel about their government, for fear of repression. These are two key points also. I do not get involved in politics anywhere. My feeling is that time is better spent adapting to whatever the politicians do rather than joining into the political fray. Reality is that if you do business fair and well, whatever the political system is you’ll be welcome. The second point is about freedom of speech. I recall feeling fear like this recently when talking to my son over the phone. I was about to make a joke about a certain president and decided not to thinking… I had better not joke about this. The problem was I was in the US… not Ecuador. The great technology that has created such great access to information has destroyed our privacy as well…everywhere. My new real estate acquisitions are in Ecuador . Recent messages have looked at the importance of seeing reality. People write often asking if it‘s safe in Ecuador. I was thinking of the reality of this as Merri and I concluded a long Ecuador morning walk. The birds were singing, roosters crowing in the distance and we saw two very young children, a girl of maybe six or seven and her little brother maybe four or five walking alone through the village on their way to school. This is so typical in Ecuador. I wondered how many children of that age in North America are allowed to walk alone through town as they are in Ecuador. 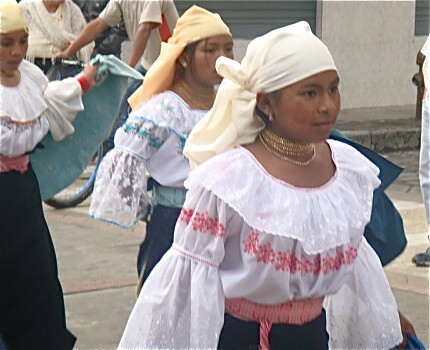 More Cotacachi children in a parade. You see young girls like this (maybe eleven or twelve) walking around night and day. This is not because Ecuadorian parents are careless. It is because there is a great deal of safety in Ecuador . Here are a few facts I know. #1: The Ecuador constitution protects landownership of citizens regardless of citizenship. No local government can take land by eminent domain for economic development. #2: No Ecuador children have been shot in school. 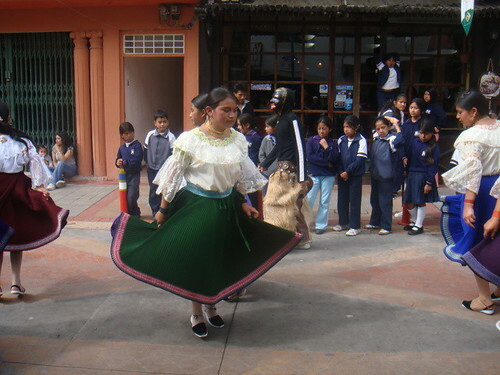 #3: Ecuador schools do not require metal detectors. #4: No Ecuador police force has used a “no knock” search warrant to break down a door and then shoot an innocent 80+ year old resident 50 times. #5: We do not worry in Ecuador about being sued if someone spills hot coffee on themselves at our hotel. By the way our coffee is hot here. #6: Ecuadorian doctors do not have to shut down their practices because of malpractice insurance costs. #7: Parents in Ecuador are not at risk of having their child diagnosed as having ADD and being forced to give them Ritalin. Read http://www.ritalindeath.com/ if you want to have your heart rendered over the weekend. 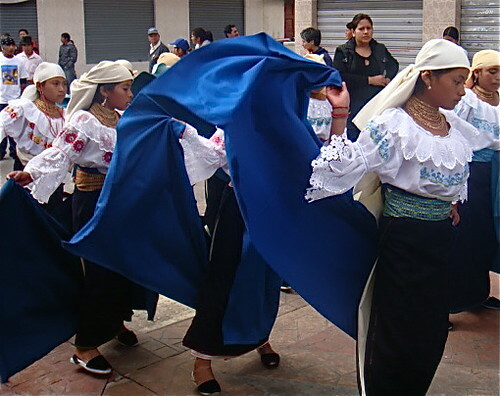 There is a deep culture in Ecuador. Back in early 2007, a potential real estate buyer visited me about buying a $93,000 house in Otavalo. As we enjoyed a “cuppa tea” and visited I could see he loved the house but was really worried about loss of property due to Ecuador’s constitutional reform. My view was that the reform was unlikely to reduce individual land rights. As we can see above, the opposite took place. the constitution strengthened property protection. Ecuador’s base of wealth has always been individual land ownership. Then I pointed out to this potential buyer that his real bigger risk was buying a similar three bedroom house in England. A similar house would cost him between $400,000 and a million dollars. The risk of losing $93,000 in value when the overheated English real estate market dips seemed greater to me than the chances of losing $93,000 in Ecuador because a house would taken due to constitutional change. Prices were way overblown in England. This was exactly what happened. Real estate crashed in England while real estate prices in Ecuador have remained strong. Plus Ecuador offers the benefits of $1.40 a gallon gas, lovely weather, sweet people, no capital gains tax on real estate sales, very inexpensive but good medical and dental help, ridiculously low property tax, almost no tort liability, inexpensive cost of living, low crime and better food. In the west, the cost of living is so high that many people can barely move! So where is it safe to live? I think when Merri and I are really realistic, we feel that there are many aspects of safety in Ecuador. Many of us feel many changes in our homelands that are not good. If you do, don’t despair, the sun always shines somewhere as it did here in Cotacachi, Ecuador. Here’s the sun coming up! Merri and I always practice diversification…in asset class as well as geographically. We are over weighted in Ecuador so we are voting with our money that the chaos here will create more opportunity than trouble. 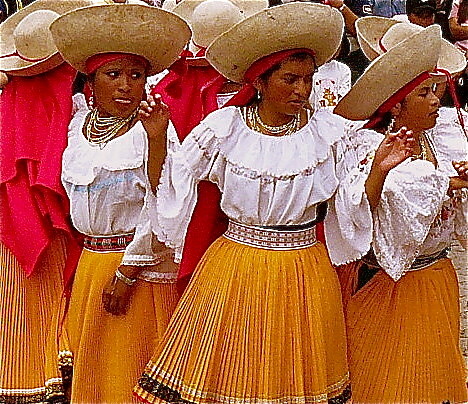 See more about Ecuador diversification here. Change and chaos are parts of the rhythm of life. The never ending evolution created by time and space creates turmoil but also opportunity. We hope the chaos in your life brings only good to you. Combining good international investing with the greatest asset of all, the ability to earn wherever you live, brings everlasting wealth in chaos. Here is an email for a recent seminar delegate: Amazingly helpful, amazingly timely … thank you for this !